Get your Code: 40% affiliate commission. Place your code on own site. Promote your website or blog. Choose text codes and images. Get paid the next month. Catholic Affiliate Program: Catechism worksheets, audio, and coloring pages. Create a page on your site to our site to earn money from our affiliate program. Drive traffic to your page. So your visitors may buy our products. If they do, we pay you 40% with six months cookies, meaning if they buy even five months later, you receive your commission in the sixth month. Perfect for bloggers, websites, school and parish fundraisers. Create a page for our products and link to it from your related pages. Promote your page in emails and social media. And you do not have to handle the product - even our CDs. How? First, sign up or get your code at E-Junkie at no expense to you (but time). G to Admin to add your affiliate code to your site. (See editable samples below in section 4. These include the SEO friendly nofollow code). Promote your page with email announcements, social media, and web pages. We deliver the download products through our affiliate program or mail the actual CDs for you. We earn more from this than any other promotion on this site. You can too. In order to comply with FTC regulations: Any affiliates who are providing content or reviews of SaintAnnesHelper must clearly state that they are receiving monetary compensation BEFORE the tracking links or banners directing them to SaintAnnesHelper landing pages. Disclaimers at the bottom or end of the article will not be sufficient. Non-compliance with these FTC regulations will risk removal from our program and commissions could be subject to reversal. Further more any SaintAnnesHelper affiliate who plans to promote SaintAnnesHelper offers through social media must state clearly 'AD:' before each post. Linking to a post with the disclaimer will not be sufficient. For more information go to the FTC endorsement guides. You can contact us on the form below for free downloads to review. Remember to include links so that we may see your websites and offer suggestions. Include any explanations that you'd like, too. You build sales credibility when you promote the products you like, so it's good to show your enthusiasm in your writing. Your visitors know and trust you and are more likely to buy from your honest recommendations. Please use the contact form below to contact us for a free download to review. Once you promote the first product you can contact us for the second free product. Those who use our products promote it best. We want what helps you because it also helps us. Be assured that we will help you the best we can. You have our good will. For highest sales, place your code above the fold in text and again toward the end of your description to receive the most traffic from your reviews and recommendations. Write a page about our downloads and describe how your visitors can use them and add text links that use your affiliate code. Link your page from a prominent spot on your website's home page, blog columns, and emails. The higher the link on your page and the more traffic to your page, the more traffic you'll convert to sales. The more traffic you have to your sites, blogs, and articles; the more sales you may enjoy. Traffic is key to sales as is ad placement. Also, please know that there are certain months in which book sales are much higher than others. There are at least four months of the year where sales are very low. Your six months cookies carry you through those times. Your banners and text links are good reminders to your visitors in the meantime. The more often they click through your code, the longer your six months extend endlessly. If you've read this far, we know that your interest is serious. Please know that, if we see that you have an active website or blog, we are happy to send you one or more downloads to preview. Use the contact form at the bottom of this page to make your request or call us at 785-456-1711. Including the address of your websites or blogs can also help us make suggestions. Once you place the E-Junkie code to our Catholic ebooks and Catholic audio books on your site, all you need to do is promote your page where your codes reside and your affiliate codes will do the rest of the work. Each visitor that clicks will be your customer for six months whether he or she buys at that moment or not. Example: If your visitor clicks your code for our product, any time that he or she buys our product in the next 6 months you will receive the 40% commission. Whether your visitor leaves the page or leaves the site, as long as he or she clicked through your affiliate link, his or her "cookies" are marked and you get the credit for that visitor's purchases for 6 months. You can become our Catholic affiliate by placing an affiliate link on your parish website to earn 40% per sale. It's that simple. What better than Catholic coloring pages and printable Catholic worksheets to help you spread the faith and support your parish? Catechists love the catechism resources. Adults like the audio downloads. Children love the Catholic coloring pages. Sponsors and families will be glad to give the CDs as gifts of faith. Homeschoolers lover the manuscript and cursive handwriting pages. Your visitors will receive their downloads automatically, and we will ship any CD orders for you. Win. Win. Win. You can also help your parish earn money on an every day basis by setting up an account for them and placing an affiliate code on your website or theirs. New visitors can learn the Baltimore Catechism. Parents can have help reviewing with their children. Teachers can print and re-print coloring pages and worksheets. You only need one E-Junkie account to join affiliate programs offered by any number of other merchants as well. You can be a Catholic affiliate of Saint Anne's Helper. You can be an affiliate with other webmasters. 1. Click Saint Anne's Helper sign-up link. 3. You will then arrive at Affiliate Admin. 4. Click Get Affiliate Code. 6. Select Saint Anne's Helper. Since we have "Common Affiliate Settings" for all our products, copy our Common Hop Link code, which will redirect your buyers to our order page (see more about Hop Links below). 8. Paste your link code into the HTML source of your own Web page. See images below. 9. Click the More Info button to arrive at this page that you are on right now. 10. Click the Contact Merchant button to send us a message or Contact Us through this site or from the form below. 11. Promote on a page on your website or blog. 12. Promote your blog or website page as often as you like. *Note: if you did not find St. Anne's Helper listed in your Affiliate Admin > Get Affiliate Codes screen, you may need to click our sign-up link again. Traffic is key, and promotion to that traffic is next. The better you promote and edify our products, the better sales conversions you will have. If you have enough traffic to a page that has a good promotion, you will get sales over time. The best way is to add the code to CSS includes that show on all pages, especially as a short paragraph of text with a link to your code. It's as easy as Adsense, yet often pays better especially on a Catholic site. Text links seem to have the best conversion rates, so include your code in the text of your recommendations as well as in the banners available below. Enter the code on your related pages, especially the pages that have high traffic and apply to young Catholic families. Everything is automatic once you've posted the Catholic affiliate program code. You do not have to worry that your visitors will not use your code, it's included in the link if you replace your number for the term YOUREJCODE. You can even sell the hard-good CDs. Many affiliate companies cannot offer both downloads and hard goods, yet we do offer you that flexibility. Also, we don't touch a thing except to send commission payments, unless your visitor buys a CD in which case we mail it out for you during US Post Office hours. This ensures that we can pay you the right commission. You are hereby given permission to use our artwork, graphics and descriptions to promote our products on your site. Simply hover over the image you would like to use, right click, and "save as" to load the image to your computer. Be sure to use with terms like "Baltimore Catechism resources" or "First Communion downloads". Saint Patrick's Day? Irish site? March? Showcase our Saint Patrick ebook download. Catholic home school curriculum ideas? Showcase our Coloring Pages To Print and printable worksheets, etc. Gifts of Faith for grandchildren or converts? Christmas? Birthdays? 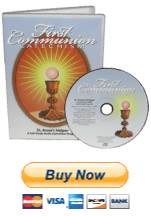 Promote First Communion and Confirmation audio CDs since they can be wrapped as gifts. We've searched through many affiliate programs so that we can offer an easy system for you to sell our products. We want sales to be easy for you, so we are ready to help. Be encouraged use the Contact form below to call 785-456-1711 if you would like help. We can walk you through the steps. Use the following codes with your E-Junkie code. Remember that using text links in your website and blog content and in your emails and email signatures are said to yield the highest sales, so include your code in text on many pages for the best sales conversions. Banners and images offer brand recognition, too, so we have a selection of images below for you to place on your pages, includes, and blog columns. Be sure to replace the RED YOUREJCODE with your E-Junkie code number in the following code and may God grant the increase. The following html codes will allow you to place the picture you choose and your affiliate code on your site. Again, be sure to replace YOUREJCODE. with your own E-Junkie code number in the following code. Highlight and copy all the code and paste it where you want it on your website or blog. The more traffic that you send to the link and the better you edify the product the more sales you will receive. Choose your size and color scheme below. We offer two color schemes: a light blue and a dark blue set of images. Remember to replace the red with your own code at the end. When your visitor clicks your Hop Link E-Junkie sets a cookie in your buyer's browser which works for 6 months. All in the same stroke E-Junkie redirects them to our products page. Every affiliate-eligible product that your buyer purchases from us during the life of that cookie (six months) will earn you a commission, even if they go back to our site directly from the Internet at a later date without clicking through your link again. We pay our commissions on a monthly lump-sum basis via PayPal in the month following a completed sales month (e.g., commission for sales made in January would be paid out in mid February). Make sure you have entered your PayPal email in Affiliate Admin - Edit Profile. We recommend E-Junkie heartily since it is an American based company with some excellent features that we have not found anywhere else, especially the 6 month cookies for your visitors. It's easy to make a commission from both CDs as well as the downloads. Whatever benefits you benefits us! We offer a good affiliate commission so that it is worth it to you to sign-up, to load the code, and to promote your page. We pay 40% per sale. We appreciate the work that you do to promote our products on your website, blog, or ezine so we want the commission to be high enough to compensate you for your promotions. Our affiliate marketing program allows you to upload your code easily and begin to generate automatic residual income immediately. If you have traffic and well placed code, you'll gain sales. We pay you two weeks after the 1st of the subsequent month, generally around the 15th. Our First Communion and Confirmation audio products are $19.98 each which yields $9.99 for your account. There are companion booklets and worksheets, too, and you receive 40% of each sale. We also have excellent ebooks that to add to related pages: Saint Patrick history - St. Patrick Apostle of Ireland and one of the most beautiful children's books online called Children Of The Kingdom. Again, 40% of each sale. If you've done the work to generate the traffic to your website or blog, these downloads can make your traffic profitable. Traffic is key to generating sales. Why would your visitors buy Audio book Catechisms for First Communion and Catholic Confirmation? Our audio catechisms have the best Catholic answers and prayers for receiving the sacraments since they use the Baltimore Catechism answers. The audio products are arranged with each question and its answer on its own track for easy navigation. An awesome catechetical resource for parish schools, CCD, CRE, and Catholic home school. Excellent fundraiser for Catholic institutions. Students have an easy way to memorize the Apostles' Creed, the Ten Commandments, and the prayers of the Rosary. This is a God-send for students who have little help or time at home. It's easy. Just go to the specific track and press "repeat one". Do you want a self correcting quiz? Easy. Just press "pause" between the question and the answer. The text is reprintable for as many copies as needed. The text is also available on coordinating Catholic worksheets that are explained below. Your visitors can mix these with our Coloring Pages and create their own custom catechism or keepsake workbooks. In 2011 we also added First Communion Catechism a printable ebooklet. We later added an ebooklet to print for Confirmation. Over time and through the years, sales will increase as customers are more used to using downloads and learn to trust your recommendations. You can easily sell our Catholic affiliate program downloads and CDs. Your code does the work for you. You can see your sales at anytime. The higher your traffic is, the more products you will sell. Well placed ads/codes above the fold and throughout your pages will increase your sales. All in all, E-Junkie has the best affiliate program for generating repeat and residual income with Saint Anne's Helper, your own products, or other products on the E-Junkie Shop! We're happy To help with your Affiliate questions. PS: If you need a website, SiteSell helps you to create a website that draws traffic.